Children will love to go round and round in this small version of a Ferris wheel. - Under 42" must be accompanied by an adult. Kids will love riding dragons, sea monsters, unicorns, horses and many more fun creatures! - Must be 42" to ride unaccompanied. Those under 42" must be accompanied by an adult (someone over 42"). 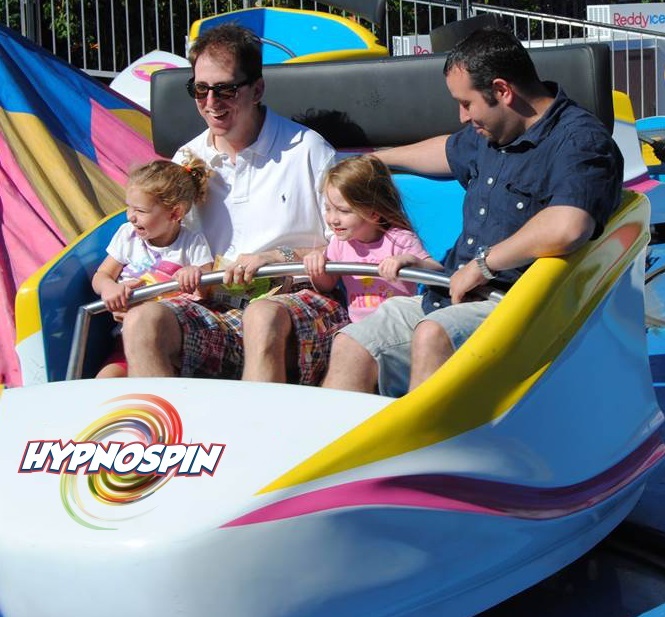 Enjoy the fresh air while riding our 65 foot Century Wheel - a great choice ride for the whole family! - Must be 42" to ride unaccompanied. Those under 42" must be accompanied by an adult (someone over 42"). Jump aboard our replica of the famous 1863 C.P. Huntington train! - Must be 42" to ride unaccompanied. Get ready for the chaos as you spin ‘round and ‘round! Must be 36” to ride accompanied by an adult. 46” unaccompanied. Kick back and relax as you soak in all of Kemah Boardwalk and the surrounding Bay! You can see miles away! - Must be 42" to ride unaccompanied. Those under 42" must be accompanied by an adult (someone over 42"). The Boardwalk Tower is down for maintenance. Children will love the suspense of being dropped, going back up, and dropped again! Sure to cause some giggles! - Must be 36" to ride. Swinging has gone to new heights! You'll feel light as a feather as you soar high above the boardwalk. - Must be 48" to ride unaccompanied. Those 42" - 48" may ride accompanied by an adult. Soar to new heights on this pendulum ride! This will definitely make your stomach drop! - Must be 48" to ride. Dare to Drop 140ft - it's a free-fall that will leave you begging for more! - Must be 48" to ride. Blast off! Rock & roll on this space adventure! - Must be 42" to ride unaccompanied. Test your courage on our 73-foot tall looping coaster ride. Go head over heels at 25 miles per hour while rotating forward and backward. Must be 48" to ride. Brave the Bullet! 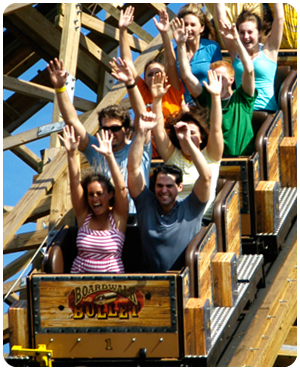 Our one-of-a-kind wooden coaster, measuring 96' tall, with a 92' exhilarating first drop and reaches speeds of over 51 mph! - Must be 48" to ride. Fly 30 mph and soar to heights of 100' over the Boardwalk. - Must be 42" to ride. 42" - 48" must be accompanied with an adult. Combined maximum weight cannot exceed 450 lbs. Persons with certain body dimensions may be unable to ride due to restraint design. Experience an incredible 25 minute thrill ride on Galveston Bay while cruising at speeds up to 40 mph. - Must be 36" tall to ride. (Not included in the All Day All Ride Pass.) Please check the Boardwalk Beast calendar for up-to-date cruising times. Arcade - Located adjacent to the Boardwalk Inn next to the retail stores on the second level. Out of this World Party Packages!